In a business like recording, education never really ends. Technology is constantly changing, techniques get better and there’s always more to learn. Recording is truly an art, but to do it well you need the proper tools and that doesn’t necessarily mean fancy equipment. If you’ve had the opportunity to observe a truly great engineer in action, you can see where the artistry lies. Their thought process has so many layers. It starts with the room the musicians are recording in and spans microphones, placement, cables, the console, and that’s not even getting into mixing. A great engineer doesn’t need a lot of fancy equipment if their technique is strong. Manipulating EQ can be like playing an instrument in itself. Adding just the right amount of compression or reverb can make a recording go from good to extraordinary. Sounds like you need a lifetime to figure it all out? Perhaps. But luckily a lot of gifted engineers and producers are willing to share their secrets. 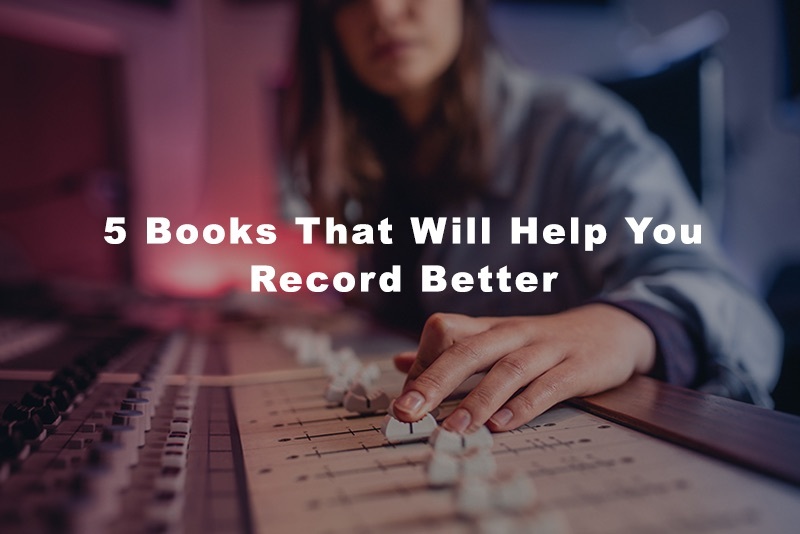 There are several books about the recording process that can open your eyes and ears to ideas you wouldn’t have considered otherwise. Some ideas are new, but certain tried and true methods simply stand the test of time. 1. Hal Leonard Recording Method: Book 2 – Instrument and Vocal Recording, 2nd Edition – This book starts at the beginning, the recording process at its core. After all, if you do a great job recording vocals and instruments, it makes your job much easier because they already sound great. The book focuses on recording the best track possible regardless of the studio and equipment you’re working with. In this later edition, it also includes QR codes that take you to other resources online to further your education. You’ll have access to audio and video clips that will really bring their tips to life. The author, Bill Gibson, has been recording for over 35 years and has written 37 books about audio recording and production. He’s written books alongside Bruce Swedien and Quincy Jones and has a fantastic blog on his website www.BillGibsonMusic.com which is a great resource for education and is updated regularly. 2. The Mixing Engineer’s Handbook: Fourth Edition – Anyone can plug in a mic and hit record, right? It’s mixing that’s the real mystery. Once considered an unteachable art, Bobby Owsinski likes to think he’s busted that myth. Used as a textbook at countless universities, the mixing process gets broken down into six different elements. Advanced techniques are explained using an easy-to-grasp method that is actually tangible. The book also includes interviews with top engineers and producers who explain some of their methods and philosophies. Bobby Owsinski has written over 20 books on recording and has mixed albums for Jimi Hendrix, The Who, Elvis Presley, Neil Young, Pantera, and countless other legends. He’s taught at Berklee College of Music and been featured on ABC, CNN, Mix Magazine, and EQ Magazine just to name a few. 3. The Art of Creating Depth in a Mix – Let’s take our mixing chops to the next level. Learn about reverb and ambience and how to create real depth in your mix, which many engineers find almost impossible. This book does outline actual techniques, but also includes the author’s philosophy and some very personal tips. Thomas Juth is a British multi-Grammy Award winning mix engineer. A mere 36 years old, he has flown to the forefront of the engineering scene because of his genius at mixing. He’s worked with artists like Jamie Cullum, Cat Stevens, Elton John, and Luis Fonsi. 4. Music Producers Handbook Second Edition (Music Pro Guides) – Being a successful music producer is the holy grail of the industry, but most people don’t realize how many roles the job actually encompasses. Budgets, contracts, hiring studio musicians, and most importantly, getting the best out of everybody you’re working with. This book also delves into the new songwriter/producer hybrid and self-production. As an added bonus, it includes new interviews with some of the best-selling producers in the business. Why am I including another book by Bobby Owsinski on this list? Because he’s really that good! 5. All You Need Is Ears: The inside personal story of the genius who created The Beatles – Written by unarguably the greatest music producer of all time; George Martin delves into his time recording the Beatles. And in case you don’t know who he is, there’s a reason why he’s known as the fifth Beatle. Written in 1994, it contains tips and techniques used decades before that. But isn’t the advice in this book outdated? HECK NO. Every person even considering a career in audio recording must read this book. It will change your life. I promise. You’d be hard pressed to find a producer who was more of a genius than George Martin. What made him so brilliant? He created recordings that were years ahead of his time, using almost no technology. Not to mention, he was the first to do so. This book will take you into his brain and leave you thinking outside the box for the rest of your career. This well-rounded list is just the tip of the iceberg when it comes to resources that will improve your performance in the studio, no matter what side of the board you’re sitting on. If you truly want to be the best in the studio, you must study all of the moving parts that go into a great recording. Aside from the musicians and the gear, a certain magic happens once that tape starts rolling, be it analog or digital. And with practice and passion, you’ll be able to capture it. allison Lukin: Alison Lukin has been working as a freelance writer for over 15 years. With clients ranging from marketing firms to yoga teachers, music has always been at the center of it all. She is a classically trained pianist with a B Mus from William Paterson University in Music Management. After graduating, she was an assistant engineer at Sound on Sound Recording in New York city. Her career in writing began in music journalism doing interviews with artists like Maroon 5 and Jason Mraz, countless concert reviews around NY and NJ, and eventually writing over 300 published articles. She is currently an active blogger and online content copywriter with almost 100K followers on Twitter.